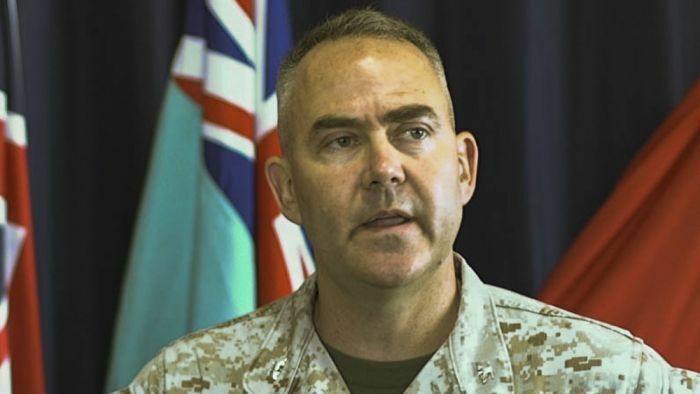 The head of the US marine force stationed in the Top End has been relieved of his command for drink-driving on Darwin’s nightclub strip. Colonel James Schnelle, 48, appeared in Darwin Local Court this morning, charged with medium-range drink-driving. The court heard he failed a random breath test on Darwin’s Mitchell Street in the early hours of a Sunday morning late last month. No conviction was recorded, but the court heard Colonel Schnelle had been stood down from his job of commanding the largest contingent of Marines ever to rotate through the Top End. The court heard Colonel Schnelle was stopped at an RBT outside the Darwin Entertainment Centre on Mitchell Street at 2:20am on Sunday, September 30, where he recorded a mid-range reading for blood alcohol content. He had been at Shenanigans Restaurant and Bar in the CBD and was driving home to Larrakeyah, a suburb about 3.4 kilometres away. Following the RBT, the court heard he then walked home. He then emailed superiors at 6:33am and they called him at 7:47am to relieve him of his command, the court heard. Today he pleaded guilty in court to driving with a medium-range blood alcohol content. Colonel Schnelle is the highest ranking US Marine in Darwin, and is a decorated commander with three service awards. His lawyer said any conviction would affect any assignments or promotions he could hope to get in future. “It’s a sad day for a person of such outstanding character, but you can’t ascribe it to bad luck,” Judge Greg Cavanagh said. A $500 fine was issued and Colonel Schnelle’s licence was suspended for six months. US Marine Corps communications officer David Mancilla said Colonel Schnelle was relieved of his duties due to “a loss of trust and confidence”. He said the military had also started an internal investigation. Lieutenant Colonel Jeramy Brady will be the new officer-in-charge for the remainder of the rotation. Next articleWho is Jair Bolsonaro, Brazil’s far-right presidential candidate?